Artificial sweeteners have become a hot topic in recent years. Products like Splenda have convinced consumers that they can have things that taste sweet while at the same time avoiding the extra calories. While Splenda is newer in the past decade or so, artificial sweeteners have been around much longer than that. 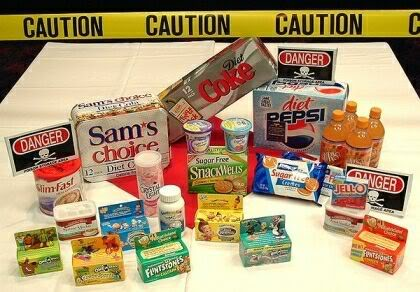 Diet sodas and sugar-free gum are a couple examples of products that contain the chemical aspartame. Within the past several years, however, more research has come out about the negative effects of aspartame on the body. Manufacturers became worried about losing consumers due to the negative connotations with aspartame and thus changed it on food labels to NutraSweet. You can see how NutraSweet sounds more “real” and better for you then aspartame does, right? But, aside from the potential harmful effects of aspartame on the body, artificial sweeteners also can have a negative impact on your ability to lose weight. When your body ingests an artificial sweetener, it can worsen your insulin sensitivity (sometimes to an even greater degree than sugar). Your body is easily tricked into thinking that artificial sugar is real sugar but, then, it’s not getting the calories that it’s looking for. This could lead to very strong carbohydrate cravings and those sugary, starchy, or processed carbohydrates are not going to get you closer to your goals. When is it okay to use artificial sweeteners? First, consider what type of artificial sweetener you're using. A more natural alternative to aspartame is Stevia extract. While you don't want to base a large portion of your diet around a better artificial sweetener, having a little bit of Stevia in your coffee might not be the worst thing as opposed to sugar. However, making even the good artificial sweeteners a stable part of your diet might lead you away from "real food" and you’ll start eating the things that you know will not get you closer to your goals. Things that don't have calories aren't necessarily good for you! Today, please consider even the smallest way that you include any artificial sweetener in your life and brainstorm how you might be able to modify this with a healthier alternative!